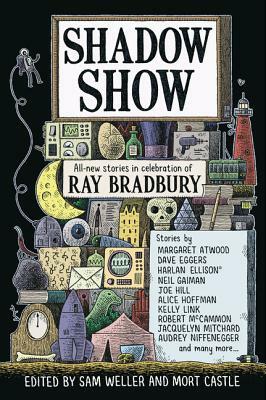 In Shadow Show, 26 acclaimed writers have come together to pay tribute to the work of the one and only Ray Bradbury with never before published stories inspired by the master. The incomparable literary artist who has given us such timeless classics as Fahrenheit 451, The Martian Chronicles, The Illustrated Man, and Dandelion Wine, is being honored by some of the most notable names in the writing world—including Neil Gaiman, Joe Hill, Audrey Niffenegger, Margaret Atwood, Alice Hoffman, Robert McCammon, and more—with new short fiction that thrills, frightens, moves, and dazzles in the great Bradbury tradition. Edited by Sam Weller and Mort Castle, with an introduction by the man, Ray Bradbury himself, Shadow Show pays well-deserved homage to one of America’s greatest, most celebrated authors. Sam Weller is the authorized biographer of Ray Bradbury and a two-time Bram Stoker Award finalist. He is the author of The Bradbury Chronicles: The Life of Ray Bradbury (William Morrow, 2005), and Listen to the Echoes: The Ray Bradbury Interviews (Melville House Publishers/Stop Smiling Books, 2010). Weller has written for the Paris Review, National Public Radio, and is the former Midwest Correspondent for Publishers Weekly. His short fiction has been published in numerous journals and magazines. Mort Castle is a horror author and a writing teacher who has published over 500 short stories. Twice a winner of the Black Quill award, seven times a Bram Stoker Award nominee, Castle edited On Writing Horror, the primary reference work for dark fiction authors. He lives near Chicago with Jane, his wife of 40 years. Sam Weller is the authorized biographer of Ray Bradbury and a two-time Bram Stoker Award finalist. He is the author of The Bradbury Chronicles: The Life of Ray Bradbury (William Morrow, 2005), and Listen to the Echoes: The Ray Bradbury Interviews (Melville House Publishers/Stop Smiling Books, 2010). Weller has written for the Paris Review, National Public Radio, and is the former Midwest Correspondent for Publishers Weekly. His short fiction has been published in numerous journals and magazines. He lives in Chicago with his wife Jan and three daughters.